Home » Christmas » Joyeux Noel! I am — and always have been — a huge Christmas Queen. (My hubby Joey, on the left, is definitely my partner in crime when it comes to Xmas obsession!) I love everything about the holiday season, even crowded malls and wrapping presents. And while Paris doesn’t go overboard at Christmas like many other European cities (Vienna, Salzburg, anywhere in Bavaria, Germany), the City of Light is still a delight during the holiday season. Here’s a peek at some of my experiences from my visit a year ago. 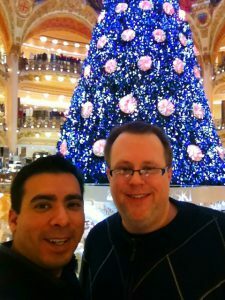 There’s lots o’ pics here, so you’ll really get a good sense of what the holiday season is like in Gay Par-ee. For me, it was an absolute thrill and provided me with holiday memories I’ll cherish for the rest of my life. Joyeux Noel! This entry was posted in Christmas and tagged Candy Shops, Champs Elysees, Christmas, Disneyland Paris, Holidays, Hotel de Ville, Marais, patisseries, restaurants, shopping by Bob Adams. Bookmark the permalink.